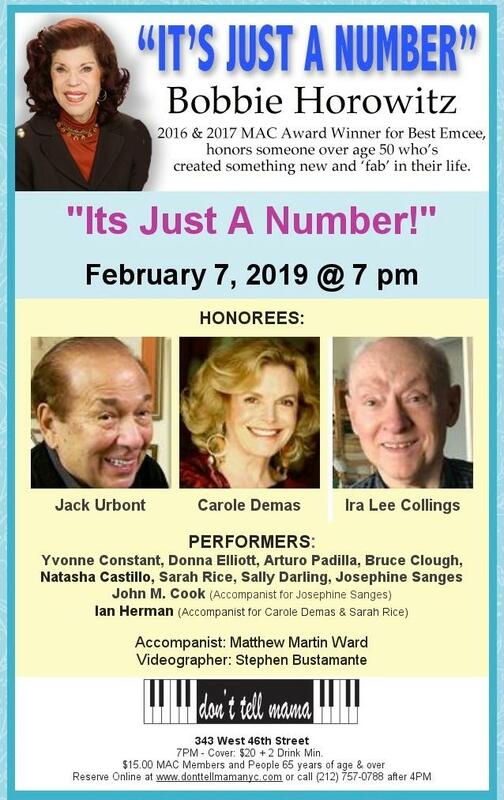 The fabulous Bobbie Horowitz continues as host of “It’s Just a Number” at Don’t Tell Mama on February 7 honoring Jack Urbont, Carole Demas and Ira Lee Collings. Performers include: Yvonne Constant, Donna Elliott, Arturo Padilla, Bruce Clough, Natasha Castillo, Sarah Rice, Josephine Sanges and standing in for Sally Darling (who is having a minor medical procedure), ‘Mama’s Next Big Act’ winner, Lynda Rodolitz. John M. Cook will be accompanying Josephine Sanges and Ian Herman will accompany Carole Demas and Sarah Rice. Accompanist for all other performers: Matthew Martin Ward.